Morning, guys! I thought I'd do a quick post to clear up some questions about my course and things related to it. 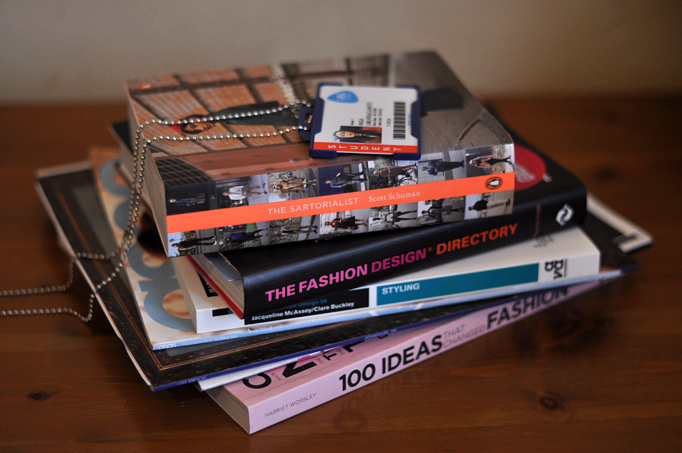 I'm doing Fashion Futures with Photography which is a combined degree in UEL. It's only my second week there but the program has been quite intense from the beginning, so we'd already gotten out on assignments and visited exhibitions. Briefly, it's a course for people who like fashion but are rather into working with ready garments than designing themselves, so no drawing and sewing (hopefully). I also wanted to continue with my photography and get into more detail having learnt basics at college last year, so this course seemed like a perfect combination for me not having to compromise neither of my two passions. Also, many of you keep asking which equipment I use to take my photos. It's Nikon D90 with 50mm 1.4/18-105mm lenses. I've had this camera for a year and I'm still happy with it, not planning to upgrade any time soon. Hey, I have same or similar book - "Styling: Inspiration and creation" by Simon Seivewright, publishing by Ava. This book is very inspirated and it give me much interesting informations. Wish you luck at you course! I want all those books! I've been following you from the start; I absolutely love your blog! Keep posting a lot :) and your course seems so interesting! You look fab in red! Ps: enter my Grazia giveaway: win à studded bag from Mimic Copenhagen!!! I love all your photos! I can feel grace, elegance, style when I am looking on them. So inspiring! Keep allways looks amazing. i like the top book. Hi could you perhaps give me the title of those books and some suggestions?